We complete 95% of the requests we receive and refer the rest to other staff outside Residential Facilities. 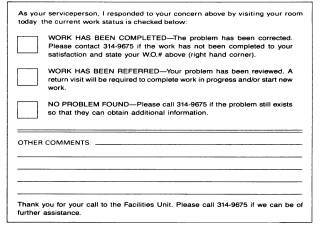 A copy of our work order will be left in your room to let you know the repair was either completed or had to be referred to another work group for additional follow-up. We sometimes arrive and can't seem to find or reproduce the problem as written on the work order. Our staff member will return your request to our Service Center staff who will contact you. If you feel we should still respond, please ask us to do so. We couldn't find or reproduce the problem. No work will be performed at this time. We do not provide the service you requested. Certain services are not provided, such as supplying orthopedic backboards that should be prescribed by physicians (but we will provide a piece of plywood to put under a mattress if requested). We also will not repair personal property. We can unexpectedly run out of spare parts and supplies. Some purchases are delayed in shipment. As a rule, though, we tend to keep spare materials on the shelf to avoid such problems. When appropriate, work may need to be coordinated between work crews or scheduled sometime in the near future to best use available staff or avoid disruptions to residents. 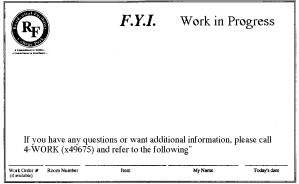 When we know about a circumstance that will delay our work in common areas of the building, staff use an F.Y.I. card to alert residents in the affected area about the nature of the problem and the anticipated length of any delay. Some repairs are deferred, making it appear they are never corrected. This could be our choice (We'll replace carpeting in the summer when the building is empty!) or your choice (My space really needs to be painted, but don't do it while I'm living in the room!). Minor damage to furniture surfaces may wait several years until we schedule a refinishing program for solid wood lacquered pieces or schedule large-scale replacement of formica desk or dresser tops. Other work, such as responding to holes punched repeatedly into ceiling tiles glued to student bedroom ceilings, will be deferred indefinitely. We complete over 35,000 work orders a year and several thousand jobs each summer to prepare the halls for resident students and summer guests.